Lexus is bringing a mysterious new model to the 2019 Shanghai Auto Show later this month. The company’s Asian social media channels have released a teaser image of the mystery new model with a front that looks similar to the RX crossover, albeit with slightly different headlights and a revised grille. According to Japanese newspaper Chubu Keizai, what we’re looking at is the first ever Lexus minivan. After its forthcoming debut in Shanghai, Lexus will reportedly start building the minivan in 2020 at the Toyota Auto Body factory in the city of Inabe. This site currently handles the production of all Toyota vans sold outside of Japan. We still don’t know the name of the automaker’s first minivan, but Lexus recently filed trademark applications for the LM 350 and LM 300h names. 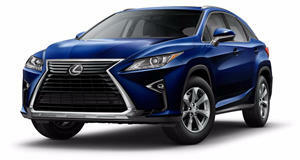 "LM” could stand for "Lexus Minivan," while the "LM 300h” name suggests there will be a hybrid variant. The luxury automaker has been considering entering the minivan for a long time. Last year, the president of Lexus Manila, Raymond Rodriquez, said a Lexus minivan was "only a matter of time” and could be based on the Toyota Alphard, which has been in production since 2002 and is made primarily for the Japanese market. While demand for minivans has fallen in the US thanks to the rise of SUVs and crossovers, the segment is still very popular in Asia since people love being chauffeured around town in them. It’s the same reason why luxury long wheelbase sedans are extremely popular in this region. It seems unlikely, then, that the luxury Lexus minivan will be sold in the US. Instead, Lexus is more likely to keep it exclusive to the Asian market.